This is an outline of work while employed by FAO Regional Office for ASIA and the Pacific, Thailand. A pdf file with full details can be downloaded or viewed here. Undertook design, sought funding and supervised implementation of industrial and horticultural crop projects, studies and feasibilities in Asia/Pacific region, worth in excess of US$ 16.7 million. Crops included coffee, coconut, black pepper, rubber, oil palm, oil seeds, tropical fruits, vegetables and flowers, medicinal and aromatic plants. (Project Details in Annex I). 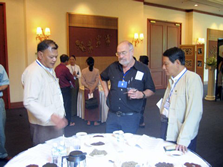 Undertook more than 70 field missions, in Asia/Pacific developing countries, involving industrial and high value crop reviews, sector studies, project identification, project design, project feasibility studies, monitoring and evaluation, and implementation support. Developed key thematic work areas in the FAO Regional Strategic Framework to meet industrial crop needs and priorities of developing countries in the region and in particular smallholder farmers. Viz. Coffee Quality Improvement and Ochratoxin Prevention in Thailand, Vietnam, Myanmar and Lao; Virgin Coconut Oil Production; Bio-fuel/Bio-energy Crops for Asia/Pacific; Interactive IT packages of Technology for High Value Crops; Matching Plants to Land; Sector and Feasibility Studies, and Project Formulation on Oil Palm including Cold tolerant Oil Palm; On-farm Black and White Pepper Production and Quality Improvement and Smallholder Marketing; Bio-control of Coconut Hispid Beetle in 6 countries with consequent savings in lost production and tree death estimated at USD70 million per year. Participated in rehabilitation of East Timor (Timor Leste) and helped design and operationalise their National Development Plan for the Agriculture Sector and coffee and coconut projects and small storage silos. Participated in Task Forces on Industrial Crop/Horticultural/Food Crop and project design issues and provided advice to all member countries of FAO in Asia/Pacific as and when required. Produced various publications, papers, manuals etc., and gave presentations to key international meetings on industrial and horticultural crops. (See separate Publications List).